If you like shooting, guns, rifles, semi-automatics or other weapons, you understand that beautiful feeling of invincibility when you hit the target. Problem is, it’s not always that easy, especially when you have to shoot fast, or you are not in the gun range. That’s why you need an item that gives you a hand. Fortunately, that item is a red dot sight. They are small objects to place on your weapon; they give out a bright red dot that focuses on your target. They are reliable and give you a great hand. Now, many of them can be expensive or too complex for beginners, hence why we came up with a list of the best cheap red dot sights. To help you find the sight that best suits you, not only are we giving you an in depth list that takes into accounts pros, cons, features and descriptions, but we are also going to touch the most important features to consider when looking to buy a red dot sight. We hope that by the end of this article you will be able to make an informed purchase. We will start by guiding you through the most important features to consider before buying a cheap red dot sight. You must understand that there are different features for different users, depending on what weapon you have, or where you plan to use it. Therefore, read all features carefully and analyze them in detail to have a better perspective when you start digging into the models. 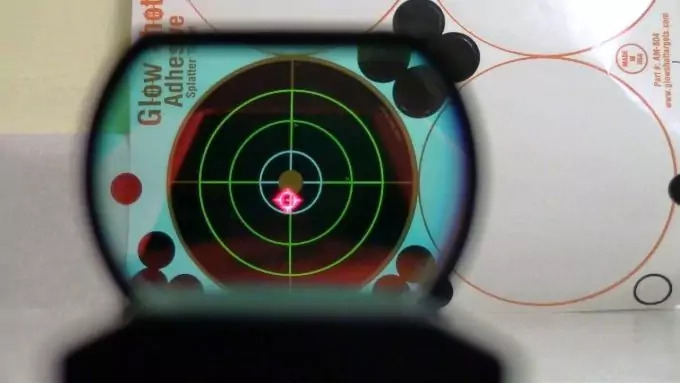 Let’s start form the core of the subject; all red dot sights have a projections, which can be either a reflex projection or a holographic projection. A holographic projection consists of the sight getting illuminated from the front of the lens, where then a laser light projects onto the viewing window which creates a red dot. All red dot sights need to be mounted into your weapon, and most weapons have one of the two most common rails: Weaver and Picatinny. Therefore, check you gun rail, then the sight, and see if one fits the other. If it doesn’t don’t panic, is as simple as buying a mount that suits both sight and weapon. However, f you have one of those two rails, then most of the red dot sights will fit perfectly. There are still some models that fit just one, and it is commonly the Picatinny, as many models have a built-in mount, but you can just replace it to fit your Weaver rail. Weight is a key factor for red dot sights and pretty much any weapon, especially if you are dealing with rifles or bigger guns. After shooting many rounds it will be quite normal to feel tired. That’s why you don’t want to add too much extra weight to your weapon with a heavy red dot sight. Clearly, they all weight something, but make sure it’s a weight you feel comfortable with, and not something that will also alter your “feel” with your weapon. For example, a very heavy sight might even cause you to change the way you shoot. 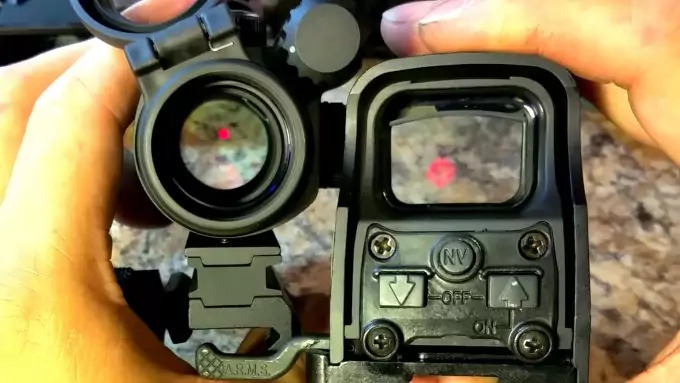 The reticle is the red or green dot that every sight reviewed in this article has. Now, that doesn’t have to be precisely a dot, as it can also be another pattern. As a matter of fact, many sights advertise themselves as having different reticles, commonly four. 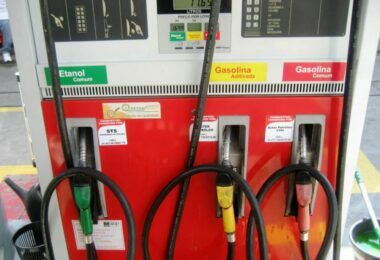 This means that they offer four different patterns of red or green dots. It can be a bulls-eye pattern, a star, or a more scattered pattern. The idea is to give you the option to choose what you seem to notice better. The MOA (Minutes of Angle) is one of the features included in the table above. It is a measurement that basically consists of a spread of 1 inch per 100 yards. Basically, through the MOA you know in the first 100 yards your red dot sight is very precise. The bigger the MOA, the more precise your sight will be, as for larger distances, it still has a good spread. However, if you are not going to shoot from very far distances, then a very large MOA will not really influence you. 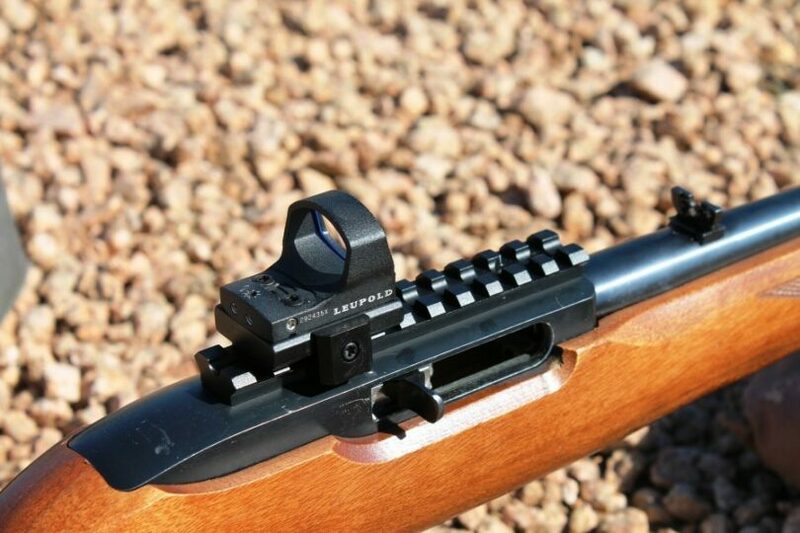 It’s time to take a look at the top reviewed cheap red dot sights. The following list contains the eight red dot sights that we recommend you looking for if you don’t want to spend much or are a beginner. Look carefully at the pros and cons, and especially at the description, as it will give you an idea of the product and if it’s suitable for you. Hopefully by the end of the read, you’ll know which one you need or want. The Vortex Optics Sparc AR Red Dot Sight is an excellent red dot sight for a very reasonable price, especially thinking about the value you will get from it. Let’s start by stating that it comes with a VIP unconditional lifetime warranty, so you can trust it will last long or you get a replacement. It is also very well designed, with multi coating and anti-reflective features on the lens, which is also very well sealed for fog proof and waterproof purposes. It comes with an unlimited eye relief, allowing you to have both eyes always on the target. Just in case, after 12 hours of use, it has an auto shut off feature that will save battery life. The only downside a few reviewers have found, is that it has to be tightened very well to the weapon, otherwise, it will get a bit loose and shots will become erratic, and you will have to stop and tighten it again. 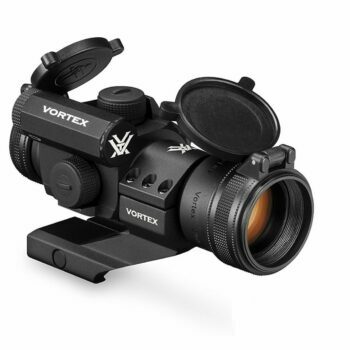 Related: The Vortex VMX-3T Magnifier is the perfect match for this or any other Vortex red dot sights. It gives an additional 3x magnifying to the sight, so you can use it anywhere with better accuracy. 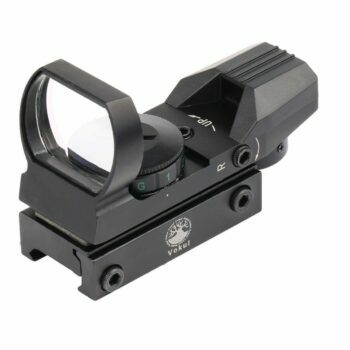 Specific features: 4 reticles, 7 brightness settings, an Allen head screw type for windage and elevation adjustments, unlimited eye relief and parallax relief, built-in mounting base for Picatinny rail. 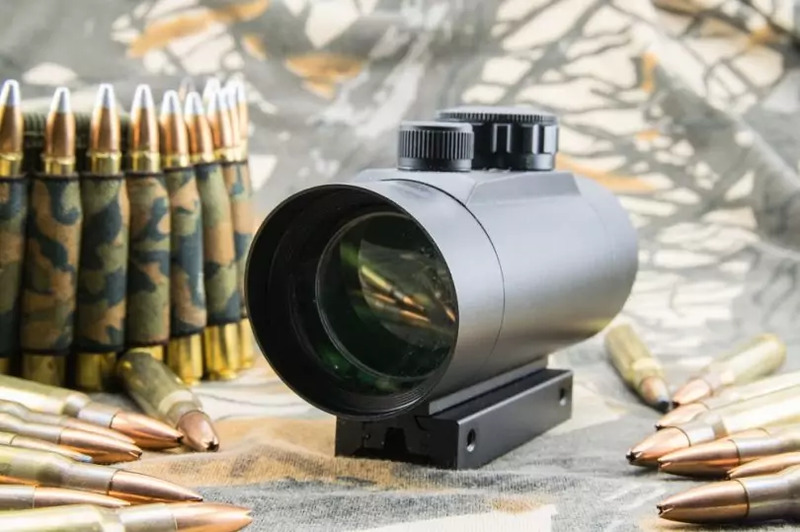 The Vokul Tactical 4 Reticle Red Dot Sight red dot sight is not only a less expensive sight than most of the others, but also a bit more basic, which makes it ideal for beginners or for less complex weapons. Nonetheless, it is still a fairly good cheap red dot sight. It comes with four unique reticles, which give you good patterns to choose from. It has 3 MOA clicks for better accuracy. It is very lightweight, so you won’t be having much added weight into your weapon. Plus, despite being a basic or a less expensive model it still has five brightness features, which are still good enough, especially when used in darker situations, not as much under brighter lights. 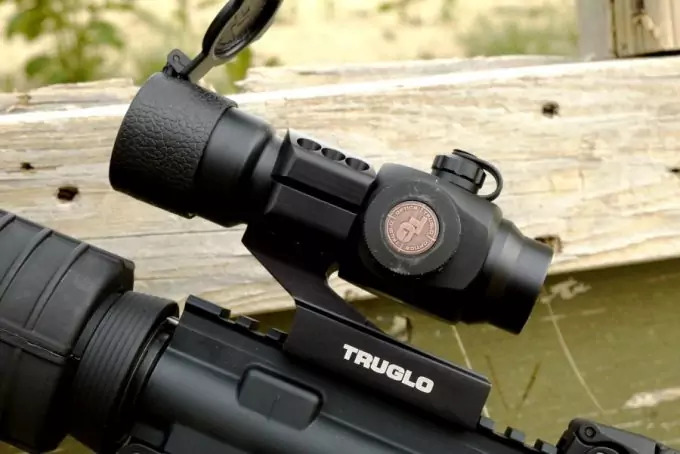 The biggest concern is the quality, this red dot sight is not the most rugged or resistant sight, and some reviewers have complained that after firing a few rounds it actually either fell from the weapon or was even damaged or stopped working. 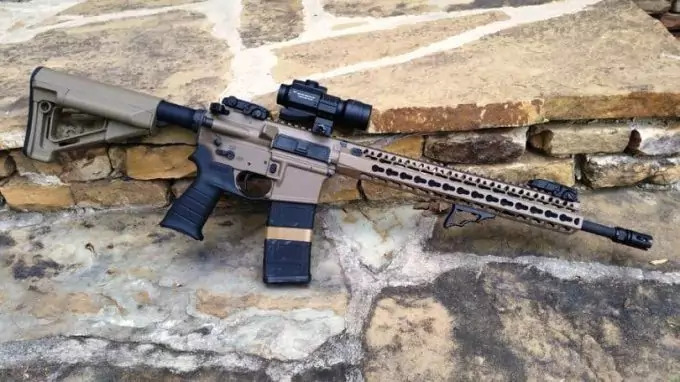 For the price, it serves the purpose of helping beginners know how to use a red dot sight, or for a quick day at the shooting range, but it’s not very reliable for more experienced shooters. Specific features: 6000 hours battery life, impact and recoil proof, 2 dots, green and red, 30 mm one piece tube, unlimited eye relief. 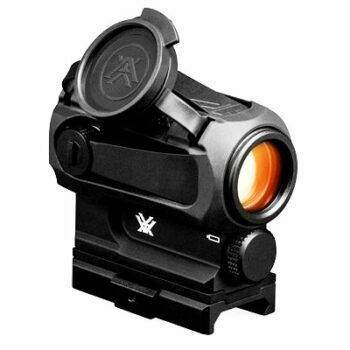 The Vortex Optics Strikeforce 2 Red Dot Sight is a solid red dot sight that will fit really well on your weapon. This is a sight with a very good impact and recoil resistance, that unlike other cheaper models, will stay sturdy and in place, reviewers even said it stayed zeroed after many shots. It comes with 6000 hours of battery life, which is quite a lot for a budget red dot sight. A great feature is also the two dots, red and green, as well as a night vision mode if you plan on using it at night or in darker settings. Plus, the dots have then different intensity levels, meaning you can adjust them for very bright scenarios as well as very dark ones, and the dot will always be visible. Related: The Vortex Flip Cap Optics is a great match with this sight. It is from the Vortex brand it will make sure that the lens is protected when carried around or not in use. Specific features: Comes with four reticles, lightweight and waterproof and shock proof, Picatinny rail mounting system, parallax designed red dot that eliminates need for centering. The Field Sport Red and Green Reflex Sight has both a red and a green dot, allowing you to choose which color is easier for you to differentiate. It also includes four reticles, to choose from four different patterns. It comes with a built-in Picatinny mount base, but if you use a Weaver, you will need to purchase a separate mount. It has the advantage of being not only affordable, but one of the most lightweight models, so if you don’t want to add much weight to your weapon, this is a good choice. Related: The UTG Riser Mount is a good addition to red dot sight. It will place it a bit higher up, for those who prefer it not entering the field of vision of the front barrel. Specific features: HD clarity on optics, eleven brightness settings, mounts both Picatinny and Weaver rails. 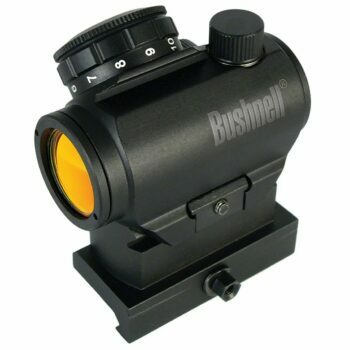 The Bushnell Trophy TRS-25 Red Dot Sight is a great red dot sight, very lightweight and ideal to mount easily on Weaver style or Picatinny rails. 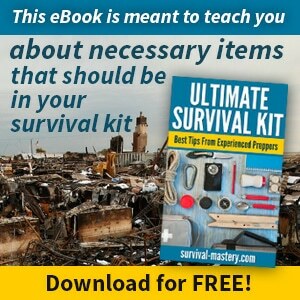 It comes with a manual to teach you or guide you how to mount it, but it isn’t very clear according to a few reviewers. 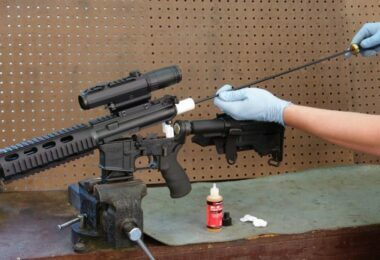 However, it’s not a complicated operation, simply use an Allen style cross screw to secure the sight to the gun’s rail, then the clamping system will provide an adequate strength that will keep the sight securely mounted. Then, to tighten it, you just need an additional quarter turn. 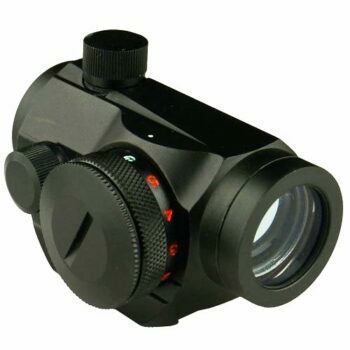 This red dot sight has premium HD clarity optics, meaning you will have a great and bright image even in darker settings. 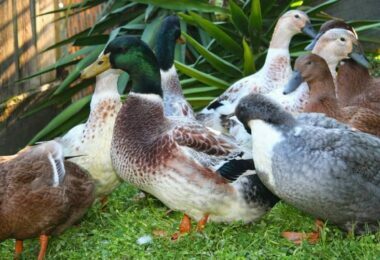 It comes with a technology called Amber-Bright optics, which will help you distinguish between black or brown colors, something that complicates under bright lights. Related: The TacStar Tactical Railmount is a good addition for those who like to have the red dot sight placed a bit higher than usual. It also fits perfectly any Picatinny rails, and it comes with a sidesaddle to store extra bullets. Specific features: Eleven brightness settings, multi-coated and scratch resistant lens, waterproof, shockproof, 50 000 hours of battery life. 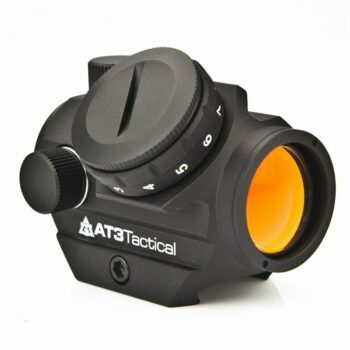 The AT3 Tactical RD-50 Red Dot Sight is a very good red dot sight that balances very well price with features and quality. This is favorite amongst beginners and more experienced shooters since it guarantees to both great quality and feel. To begin with, it has eleven brightness features, and all of them are excellent. If you find yourself under the brightest lights on a shiny sunny day, the red dot will be visible, just as if you find yourself at dusk in a tricky light setting, the dot will also be visible. The lens is well protected with multi-coated and scratch resistant features. It is also a waterproof and shock proof lens, meaning it won’t stop working after many rounds which happens to other red dot sight. Probably the best feature are the 50 000 hours of battery life, pretty much guaranteeing you that you won’t have to change it for a very long time. You might fins that it doesn’t last as long as advertised, but you can be confident that it lasts longer than the others. Specific features: Water resistant, shockproof, built-in Picatinny mount base, 4 reticle patterns. The GERO Tactical Red Dot Sight is a good and accurate item. It stays zeroed for many rounds, and it can take a heavy punishment. This might be surprising since the price is quite low, but this just makes it a very good cheap red dot sight. As said, the shockproof feature is actually quite excellent, making it a heavy-duty sight too. 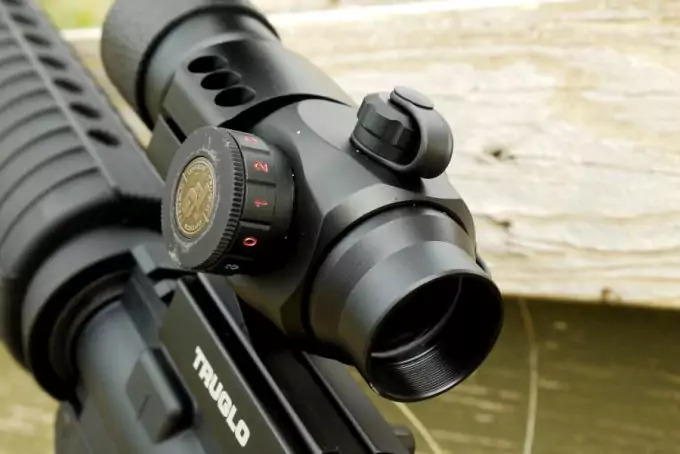 It has a good eye relief, and the reticles can be adjusted into four different patterns for a clearer spotting, as well as adjusting the brightness settings. The mounting is very easy as it comes with a built-in Picatinny mounting. 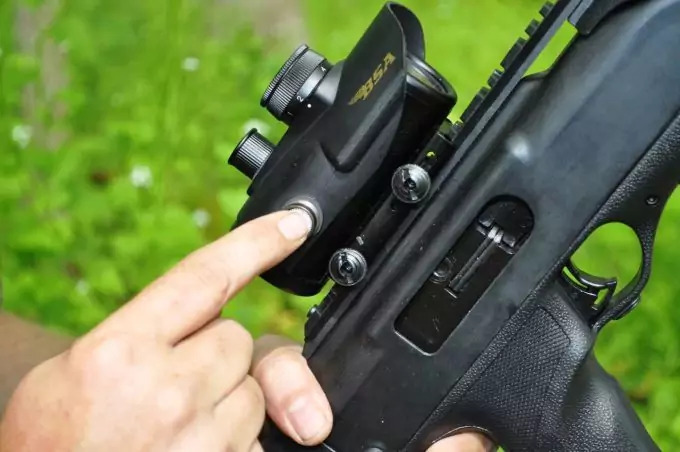 If you have a Weaver rail and want to use this sight, you will need to buy a separate mounting for Weaver rails and just use that instead of the built-in one. The only downside is durability. Reviewers find this an excellent sight for the price, as it has many features that only more expensive sights have. However, after a few weeks of use, the sight might stop working completely. 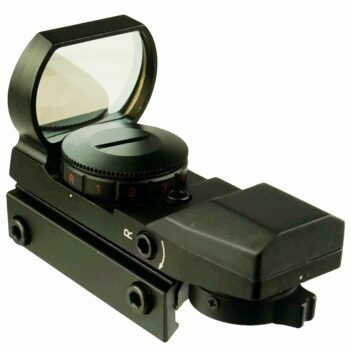 Related: The Coween Optic Lens Protector is an item you might want to buy with this red dot sight. It will protect the lens even more, and avoid scratches or any other damage. The Feyachi Reflex Red Dot Sight is probably one of the cheapest red dot sights available in the market. It is also a very good sight for a very good price. It is lightweight, ideal for heavy weapons, as you will barely feel it, or for smaller guns too. Mounting it on a Weaver rail is a very easy procedure, being one of the easiest sights to mount, dismount and handle overall. The windage and elevation adjustments are also a walk in the park. It comes with a battery, which is one of the few downsides of this sight, since the battery life tends to run out fairly quickly according to reviewers. 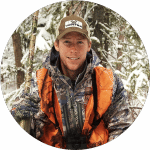 Other features include the good 33 mm objective aperture, and the four reticles, which give you four different patterns to choose from, guaranteeing you that you will quickly spot it for a better shot, especially when you have to act quickly. Related: The Outgeek Face Mask is commonly bought alongside this red dot sight. 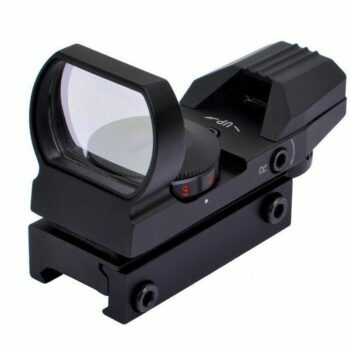 Traditionally, this mask is for paintball, and since this is one of the cheapest red dot sights out there, many users buy them for paintball. After reading the whole article, we hope you have a better understanding and knowledge about red dot sights and what features to look into. Never underestimate the importance of the difference brightness settings, as they can influence a lot during sunny days or dark scenarios, they can be the difference between accurate shots or not. Furthermore, don’t forget that shock resistant sights are also very important. Some models might have many features, but if they can’t resist you firing many rounds, then they might not be your best choice. Fortunately, this list includes very durable and resistant, cheap red dot sights. Finally, we hope that you learnt what you needed, and found the model that best suits you. Did we forget any model you were looking into? Do you have any questions? Please write your inquiries or opinions in the comment section below; we’d like to hear them!